A strategy is a plan of action designed to achieve a specific goal or series of goals within an organizational framework. Strategic management is the process of building capabilities that allow a firm to create value for customers, shareholders, and society while operating in competitive markets. Strategy entails: specifying the organization ‘s mission, vision, and objectives; developing policies and plans to execute the vision; and allocating resources to implement those policies and plans. Strategy is largely about using internal assets to create a value-added proposition. This helps to capture opportunities in the competitive environment while avoiding threats. Experts in the field of strategy define the potential components of strategy and the different forms strategy can take. strategic management: The art and science of formulating, implementing, and evaluating cross-functional decisions that will enable an organization to achieve its objectives. balanced scorecard: A strategic performance management tool used by managers to track the execution of activities within their control and monitor the consequences of these actions. strategy: A plan of action intended to accomplish a specific goal. Strategy involves the action plan of a company for building competitive advantage and increasing its triple bottom line over the long-term. The action plan relates to achieving the economic, social, and environmental performance objectives; in essence, it helps bridge the gap between the long-term vision and short-term decisions. Strategic management is the process of building capabilities that allow a firm to create value for customers, shareholders, and society while operating in competitive markets (Nag, Hambrick & Chen 2006). It entails the analysis of internal and external environments of firms to maximize the use of resources in relation to objectives (Bracker 1980). Strategic management can depend upon the size of an organization and the proclivity to change the organization’s business environment. As an example, let’s take a company that wants to expand its current operations to producing widgets. The company’s strategy may involve analyzing the widget industry along with other businesses producing widgets. Through this analysis, the company can develop a goal for how to enter the market while differentiating from competitors’ products. It could then establish a plan to determine if the approach is successful. A balanced scorecard is a tool sometimes used to evaluate a business’s overall performance. From the executive level, the primary starting point will be stakeholder needs and expectations (i.e., financiers, customers, owners, etc.). Following this, inputs such as objectives, operations, and internal processes will be developed to achieve these expectations. Another way to keep score of a strategy is to visualize it using a strategy map. Strategy maps help to illustrate how various goals are linked and provide trajectories for achieving these goals. Strategy map: This image is an example of a strategy map for a public-sector organization. It shows how various goals are linked and providing trajectories for achieving these goals. Diagnosis: What is the problem being addressed? How do the mission and objectives imply action? Action Plans: What will the operations look like (in detail)? How will the processes be enacted to align with the guiding policy and address the issue in the diagnosis? A company wants to expand its current operations to produce widgets. The company’s strategy may involve analyzing the widget industry along with other businesses producing widgets. Through this analysis, the company can develop a goal for how to enter the market while differentiating from competitors’ products. It could then establish a plan to determine if the approach is successful. Strategic management is critical to organizational development as it aligns the mission and vision with operations. Strategic management seeks to coordinate and integrate the activities of the various functional areas of a business in order to achieve long-term organizational objectives. The initial task in strategic management is typically the compilation and dissemination of the vision and the mission statement. This outlines, in essence, the purpose of an organization. Strategies are usually derived by the top executives of the company and presented to the board of directors in order to ensure they are in line with the expectations of the stakeholders. The implications of the selected strategy are highly important. These are illustrated through achieving high levels of strategic alignment and consistency relative to both the external and internal environment. All strategic planning deals with at least one of three key questions: “What do we do?” “For whom do we do it?” and “How do we excel?” In business strategic planning, the third question refers more to beating or avoiding competition. board of directors: A group of people elected by stockholders to establish corporate policies and make managerial decisions. mission statement: A declaration of the overall goal or purpose of an organization. Strategic management is critical to the development and expansion of all organizations. It represents the science of crafting and formulating short-term and long-term initiatives directed at optimally achieving organizational objectives. Strategy is inherently linked to a company’s mission statement and vision; these elements constitute the core concepts that allow a company to execute its goals. The company strategy must constantly be edited and improved to move in conjunction with the demands of the external environment. As a result of its importance to the business or company, strategy is generally perceived as the highest level of managerial responsibility. Strategies are usually derived by the top executives of the company and presented to the board of directors in order to ensure they are in line with the expectations of company stakeholders. This is particularly true in public companies, where profitability and maximizing shareholder value are the company’s central mission. The implications of the selected strategy are also highly important. These are illustrated through achieving high levels of strategic alignment and consistency relative to both the external and internal environment. In this way, strategy enables the company to maximize internal efficiency while capturing the highest potential of opportunities in the external environment. In business-related strategic planning, the third question refers more to beating or avoiding competition. Strategic management is the art, science, and craft of formulating, implementing, and evaluating cross-functional decisions that will enable an organization to achieve its long-term objectives. It involves specifying the organization’s mission, vision, and objectives; developing policies and plans to achieve these objectives; and then allocating resources to implement the policies and plans. Strategic management seeks to coordinate and integrate the activities of a company’s various functional areas in order to achieve long-term organizational objectives. Product improvement strategies: This strategy map illustrates an example of how product improvements are designed and implemented. 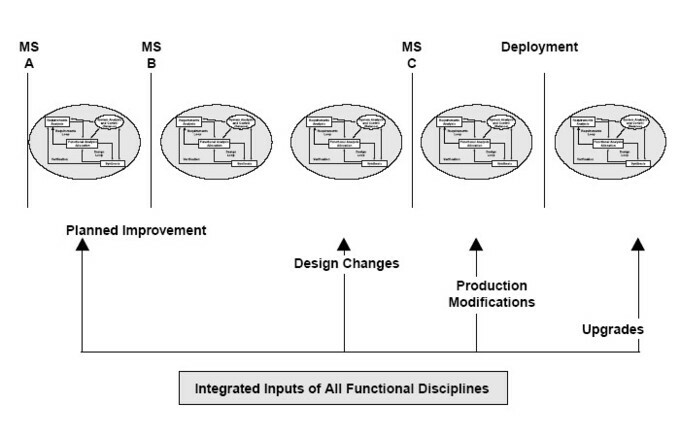 Improvements move from the original plan, to design changes, to production modification, to deployments, to upgrades. Effective strategies must be suitable, feasible, and acceptable to stakeholders. Johnson, Scholes, and Whittington suggest evaluating strategic options based on three key criteria: suitability, feasibility, and acceptability. Suitability refers to the overall rationale of the strategy and its fit with the organization ‘s mission. Feasibility refers to whether or not the organization has the resources necessary to implement the strategy. Acceptability is concerned with stakeholder expectations and the expected outcomes of implementing the strategy. Will Mulcaster provides an additional 11 strategic forces which may impact the effectiveness of a given strategy. effectiveness: The capability of producing a desired result. Effectiveness is the capability to produce a desired result. Strategy is considered effective when short-term and long-term objectives are accomplished and are in line with the mission, vision, and stakeholder expectations. This requires upper management to recognize how each organizational component combines to create a competitive operational process. Suitability deals with the overall rationale of the strategy. One method of assessing suitability is using a strength, weakness, opportunity, and threat (SWOT) analysis. A suitable strategy fits the organization’s mission, reflects the organization’s capabilities, and captures opportunities in the external environment while avoiding threats. A suitable strategy should derive competitive advantage(s). Feasibility is concerned with whether or not the organization has the resources required to implement the strategy (such as capital, people, time, market access, and expertise). One method of analyzing feasibility is to conduct a break-even analysis, which identifies if there are inputs to generate outputs and consumer demand to cover the costs involved. Acceptability is concerned with the expectations of stakeholders (such as shareholders, employees, and customers) and any expected financial and non-financial outcomes. It is important for stakeholders to accept the strategy based on the risk (such as the probability of consequences) and the potential returns (such as benefits to stakeholders). Employees are particularly likely to have concerns about non-financial issues such as working conditions and outsourcing. One method of assessing acceptability is through a what-if analysis, identifying best and worst case scenarios. SWOT Analysis: Here is an example of the SWOT analysis matrix. Will Mulcaster argued that while research has been devoted to generating alternative strategies, not enough attention has been paid to the conditions that influence the effectiveness of strategies and strategic decision -making. For instance, it can be seen in retrospect that the financial crisis of 2008 and 2009 could have been avoided if banks had paid more attention to the risky nature of their investments. However, knowing in hindsight cannot address how banks should change the ways they make future decisions. While this is quite a bit to consider, the key is to be as circumspect as possible when analyzing a given strategy. In many ways it is similar to the potential issues a scientist faces. A scientist must always be objective and conduct experiments without a bias toward a specific outcome. Scientists don’t prove something to be true; they test hypotheses. Similarly, strategists must not create a strategy to get to an end point; they must instead create a series of likely endpoints based on organizational inputs and operational approaches. Uncertainty is key, allowing strategic improvement for higher efficacy. A firm may perform a break-even analysis to determine if a strategy is feasible. The break-even point (BEP) is the point at which costs or expenses and revenue are equal: there is no net loss or gain, so the company has “broken even.” For example, if a business sells fewer than 200 tables each month, it will make a loss; if it sells more, it will make a profit. With this information, managers could determine if they expected to be able to make and sell 200 tables per month and then implement a strategy that is in accordance with their projections. The effectiveness of a strategy is heavily dependent upon the size of the organization. Size is highly relevant to organizational strategy and structure, and understanding the influencing factors is important for management to elect optimal strategic plans. A global or transnational organization may employ a more structured strategic management model due to its size, scope of operations, and need to encompass stakeholder views and requirements. A small or medium enterprise may employ an entrepreneurial approach due to its comparatively smaller size and scope of operations and its limited access to resources. Smaller firms also tend to focus more on differentiation due to an inability to achieve scale economies. Similarly, larger firms tend to have more cost-sensitive strategic capabilities. No single strategic managerial method dominates, and the choice of managerial style remains a subjective and context-dependent process. entrepreneurial: Having the spirit, attitude or qualities of a person who organizes and operates a business venture. structured interview: A quantitative research method commonly employed in survey research where each potential employee is asked the same questions in the same order. structured: The state of being organized. Strategic management can depend on the size of an organization and the proclivity of change in its business environment. In the U.S., an SME (small and medium enterprise) refers to an organization with 500 employees or less, while an MNE (multinational enterprise) refers to a global organization with a much larger operational scope. Size is highly relevant to organizational strategy and structure, and understanding the influencing factors is important for management to elect optimal strategic plans. MNEs (multinational enterprises) may employ a more structured strategic management model due to its size, scope of operations, and need to encompass stakeholder views and requirements. MNEs are tasked with aligning complex and often dramatically different processes, demographic considerations, employees, legal systems, and stakeholders. Due to the wide variance and high volume of business, upper management needs stringent control systems embedded in the managerial strategy to enable predictability and conformity to mission, vision, and values. For example, McDonald’s operates restaurants all over the globe. They have different menus in China than in France due to differing consumer tastes. They also have different hiring standards, regulations, and sourcing methods. How does management create a strategy that doesn’t confine these geographic regions (and lose localization ) yet still maintains each region’s alignment with the mission, vision, and branding of McDonald’s? Ideally, McDonald’s can construct careful strategic models and systems which control the critical components of the operations without hindering the localization. From a strategic point of view, this involves creating a system of quality control, reporting, and localization that maintains the competitive advantage of scale economies and strong branding. Large firms such as McDonald’s often achieve better scale economies and thus can pursue low-cost strategies. This requires enormous managerial competency with meticulously crafted strategies at various levels in the organization (including corporate, functional, and regional). SMEs (small and medium enterprises) may employ an entrepreneurial approach due to its comparatively smaller size and scope of operations and limited access to resources. A smaller organization needs to be agile, adaptable, and flexible enough to develop new strengths and capture niche opportunities within a competitive industry with bigger players. This requires fluidity in strategy while simultaneously maintaining a predetermined vision and mission statement. Achieving this requires a great deal of balance; it often requires a strategy that is created to enable multiple paths to the same objectives. Small firm strategies often incorporate flexibility to capture new opportunities as they arise, as opposed to maintaining an already well-established competitive advantage. In most cases, low-cost strategies require substantial economies of scale. Because of this constraint, smaller firms most often use differentiation strategies that focus on innovation over efficiency. Enabling creativity and innovation is strategically difficult to do as it requires a hands-off approach that empowers autonomy over structure. Innovate ideas are primarily trial and error, and so instilling creativity into a strategic process is also a high-risk approach. 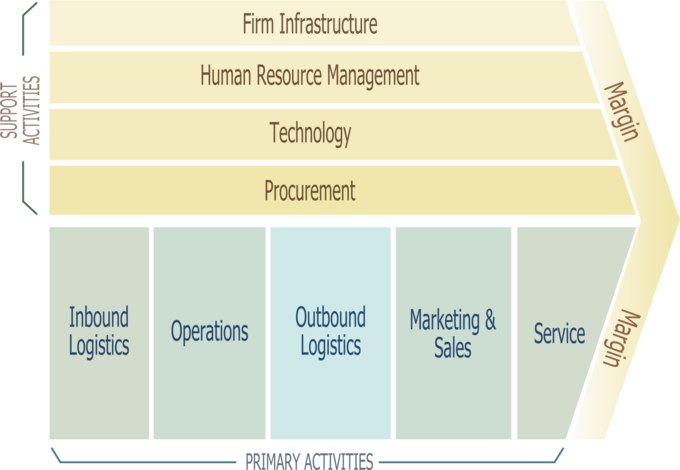 Example of a strategy map: This image is an example of a strategy map that organizes a firm’s stakeholder interests. 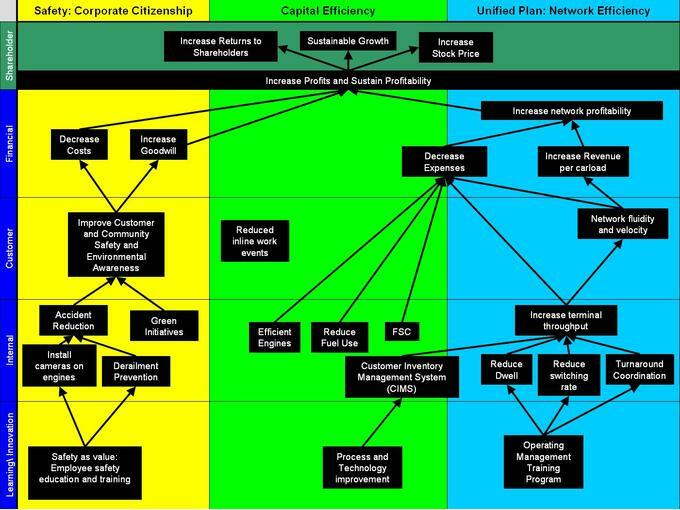 You can see the firm’s three main goals across the top (corporate citizenship, capital efficiency, and network efficiency) and the categories of potential actions down the left (learning innovation, internal action, customer action, and financial action). Analysis of both internal factors and external conditions is central to creating effective strategy. Strategic management is the managerial responsibility to achieve competitive advantage through optimizing internal resources while capturing external opportunities and avoiding external threats. While different businesses have different internal conditions, it is easiest to view these potential attributes as generalized categories. A value chain is a common tool used to accomplish this. A value chain identifies the supporting activities (employee skills, technology, infrastructure, etc.) and the primary activities (acquiring inputs, operations, distribution, sales, etc.) that can potentially create profit. The external environment is even more diverse and complex than the internal environment, and there are many effective models to discuss, measure, and analyze it (i.e., Porter’s Five Force, SWOT Analysis, PESTEL framework, etc.). With both the internal value chain and external environment in mind, upper management can reasonably derive a set of strategic principles which internally leverage strengths and externally capture opportunities to create profits. analysis: The process of breaking down a substance into its constituent parts, or the result of this process. Strategic management is the managerial responsibility to achieve competitive advantage through optimizing internal resources while capturing external opportunities and avoiding external threats. This requires carefully crafting a structure, series of objectives, mission, vision, and operational plan. Recognizing the way in which internally developed organizational attributes will interact with the external competitive environment is central to successfully implementing a given strategy —and thus creating profitability. The internal conditions are many and varied depending on the organization (just as the external factors in any given industry will be). However, management has some strategic control over how these various internal conditions interact. The achievement of synergy in this process derives competitive advantage. While different businesses have different internal conditions, it is easiest to view these potential attributes as generalized categories. A value chain is a common tool used to identify each moving part. It is a useful mind map for management to fill in during the derivation of internal strengths and weakness. A value chain includes supports activities and primary activities, each with its own components. Service: following up with customers to ensure satisfaction, provide and fulfill warranties, etc. Michael Porter’s value chain: This model, created by Michael Porter, demonstrates how support and primary activities add up to potential margins (and potential competitive advantage). Support activities include HR management and technology; primary activities include operations, marketing and sales, and service. Markets (customers): Demographic and socio-cultural considerations, such as who the customers are and what they believe, are critical to capturing market share. Understanding the needs and preferences of the markets is essential to providing something that will have a demand. Competition: Knowing who else is competing and how they are strategically poised is also key to success. Consider the size, market share, branding strategy, quality, and strategy of all competitors to ensure a given organization can feasibly enter the market. Technology: Technological trajectories are also highly relevant to success. Does the manufacturing process of the product have new technologies which are more efficient? Has a disruptive technology filled the need that was currently being filled? Supplier markets: Suppliers have great power as they control the necessary inputs to an organization’s operational process. For example, smartphones require rare earth materials; if these materials are increasingly scarce, the price points will rise. Labor markets: Acquiring key talent and satisfying employees (relative to the competition) is critical to success. This requires an understanding of unions and labor laws in regions of operation. The economy: Economic recessions and booms can change spending habits drastically, though not always as one might expect. While most industries suffer during recession, some industries thrive. It is important to know which economic factors are opportunities and which are threats. The regulatory environment: Environmental regulations, import/export tariffs, corporate taxes, and other regulatory concerns can poise high costs on an organization. Integrating this into a strategy ensures feasibility. While there are many other external considerations one could take into account during the strategic planning process, this list gives a good outline of what must be considered in order to minimize unexpected threats or missed opportunities. With both the internal value chain and external environment in mind, upper management can reasonably derive a set of strategic principles that internally leverage strengths while externally capturing opportunities to create profits—and hopefully advantages over the competition. 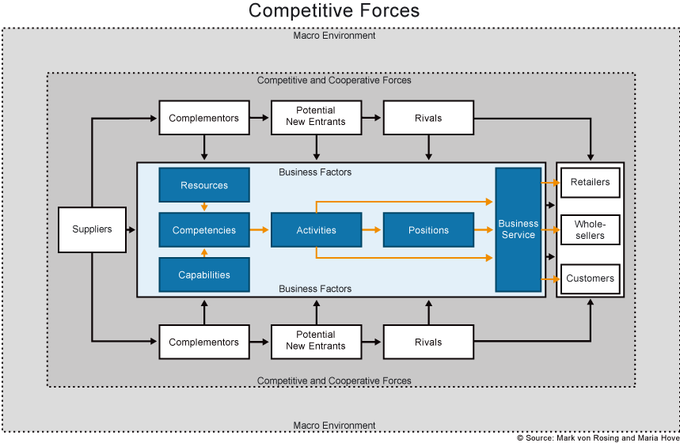 Competitive and cooperative forces: This chart diagrams the external factors that should be considered when analyzing a firm’s strategy. Competitive and cooperative forces include rivals, new entrants, suppliers, and retailers; business factors include resources and capabilities.